Francesca Zambello’s production is dramatically straightforward and the sets are restrained and fit for purpose. 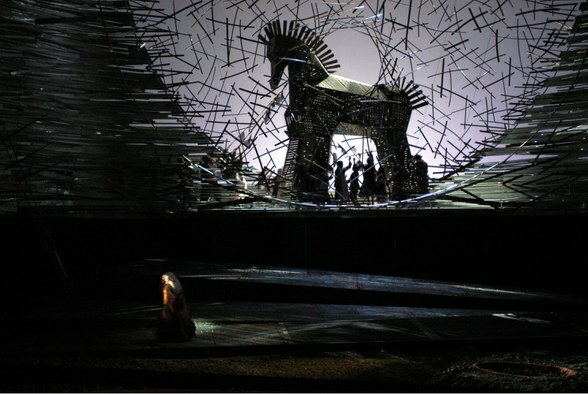 There are some interesting design elements in the first two acts where much of the time the stage is framed by a sort of lattice of spears. Costumes are simple in the extreme. The Greeks wear generic “ancient world” military outfits (more Roman than Greek ironically). The Trojans wear non descript clothes in a colour scheme that we once had a sofa in; dull purples and greys and oranges. The happy Carthaginians mostly wear white. The visual interest mostly comes from the dance elements. The choreography, by Doug Varone, is varied and for the most part interesting; though I doubt that the best choreographer in the world could retain interest during the interminable dance scenes in Act 4. It does have its curious moments. There’s a mass outbreak of dwarf tossing in Act 1 for example but for the most part I enjoyed it. One thing the Met does well is use good dancers. In a work like this it’s critical and here they were good. The two soloists were particularly fine. What about the music making? It was good. The chorus, who have a huge role, were excellent. The principal soloists were fine too. I’ve heard Susan Graham sing Didon before and she’s the goods. Deb Voight’s Cassandre was well sung and very different from Anna Caterina Antonacci who is my reference point. Voight’s Cassandre is very mush a woman on the edge. It’s easy to see why the Trojans think she’s flipped her lid. That said, she doesn’t have the intensity of Antonacci. It’s a different, but I think valid, interpretation. Brian Hymel, singing Énée, was the big surprise for me. He’s grown up. When I last saw him in Carmen a couple of years ago I wrote “He is very much a lyric rather than a dramatic tenor”. Not any more. There’s a Siegfried in the making here. Indeed so helden was his voice that some of the beauty of the Act 4 love duet went AWOL as the voices didn’t really blend (of course that might have something to do with how it was miked). He deservedly got a huge ovation. There were solid contributions from a string of Met stalwarts in the back up roles; notably Dwayne Croft and Kwangchul Youn. Excellent work too from the orchestra under Fabio Luisi. They managed to sound grand and French at the same time without becoming too strident in the brass. Barbara Willis-Sweete had control of the cameras and she was the ideal choice for this work. Of all the Met’s video directors she is the one most willing to show a wide picture of the action. I thought her choice of shots was generally very good. There was a bit of “Wimbledon” in the filming of a couple of the duets and she did get a bit ADD during the Act 4 ballets. I’m not surprised at the urge to jazz this up as they were very long but close ups just don’t work for ensemble dance numbers. Overall though, one of the better efforts by a video director at the Met. My local cinema seems to have got the message on sound. Volume levels yesterday were reasonable and the result pleasingly musical. I guess the only way I’m ever likely to see this work is on video or in the cinema so I’m glad that this was such a successful effort all round. 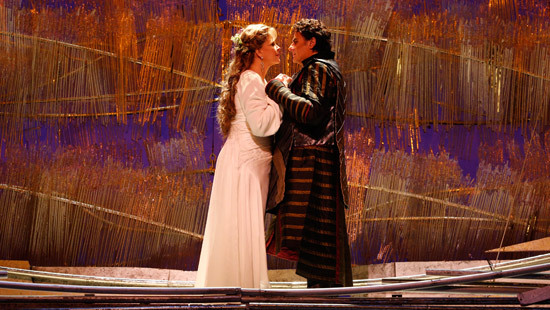 This entry was posted in Performance review - MetHD and tagged berlioz, croft, graham, hyme, luisi, methd, metropolitan opera, varone, voigt, willis-sweete, youn, zambello by operaramblings. Bookmark the permalink. Agreed John that this was one of the better filmed HDs! There were a few times in the dance numbers (the Laocoon scene in particular) where the penchant for close-ups made it a little incomprehensible, but otherwise good overall. I also really liked the Scottish singer Karen Cargill as Anna – gorgeous contralto voice and her duet with Didon is just about the musical highlight for me. I actually thought Hymel sounded great in the famous duet with Didon – at least as heard over the microphones he seemed to scale back his voice well. It was a long slog, but worth it – some of the most gorgeous music ever written for the theatre I think! Cargill was good. I’ve been watching a fair amount of French baroque rep on DVD lately and I’m more convinced than ever that close ups during ensemble dance numbers are a big mistake. “Incomprehensible” is exactly what happens.